Spring is here and has brought with it an array of fresh new fashion trends. It is time to lock away those winter woollies and don something vibrant, as we head into the pre-summer party that is the spring season. So the very basis of the bold trend is found in the colours. And you guessed it, that means big, bold and bright colours are the best way to show what you’re made of this spring. Think high saturation, bright and solid blocks of blue, pink, red, purple, yellow, orange. Any colour you like, just make it as big and bold as you can! And mixing colours to create a distinct contrast is in, but beware the clashes as they don’t do the look justice. Try to pick shades that contrast but in a complimentary way, such as a lime green bag with a bright purple dress. If the shades look a little clashy when too close together, then why not opt to keep them apart, for example opt to keep bright orange around the feet area when paired with bright pink up top. The indirect contrast works much better! Bold doesn’t just have to be about the items of clothing. You can go bold with your accessories too! We love to dress up a simple staple like a crisp white t-shirt or vest and rich blue jeans with some bold accessories. Big jewels and colourful adornments are in, so think chunky necklaces with a rainbow of colourful gems in them, dangling earrings with flashes of colour and multiple bracelets/bangles to layer up the colour on your wrists. 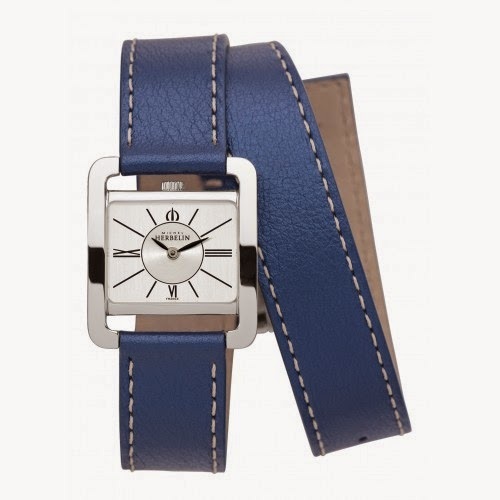 This interchangeable watch with multiple straps from Michael Herbelin is the perfect accessory for any outfit, as you can opt for the bright and bold red or purple straps to make a statement, or keep it simple and sophisticated with the classic white strap. Another favourite way to go bold is with prints. You can go for the classic and timeless animal print, the 60’s inspired paisley, bold geometric, or some of the even more daring patchwork prints, which incorporate more than one print at once. The options for prints are endless and the great thing about prints is wherever you go they will always have something new or different. Every designer has their own take on the basic print’s elements, and this is visible all the way to the high street, as different brands take inspiration from different catwalk designers. You can also choose to take the bold prints a step further by encompassing the vibrant colours of the trend. Bright colours really highlight the print’s elements, and make for a truly eye-catching look that is daring to pull off but looks stunning when done right!